This painting was created for a 1936 Shaw-Barton Co. calendar by Hy Hintermeister for a series of calendar images, all referred to as "The Great Adventure". 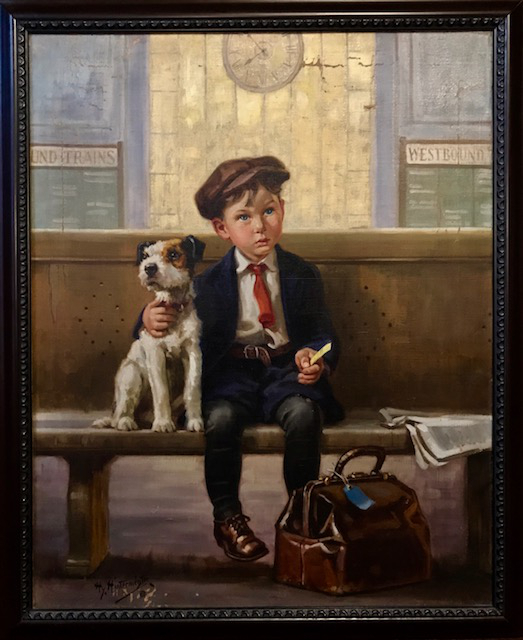 This painting, titled, "The Great Adventure" was the first in the series. This young boy is traveling with his dog to visit his grandfather on the farm for the summer. He patiently awaits to board the train at the train station. This image is also known as "Great Moments". John Henry "Hy" Hintermeister was born in 1869 in Winterthur, Switzerland. After studying at the University of Zurich, John declined a teaching position, and instead immigrated to the United States, where he found work as a courtroom artist for a local New York newspaper. His successful courtroom works led him to change his focus to illustration and magazine cover art. He worked with several major calendar companies, including Brown and Bigelow, Gerlach Barklow, C. Moss, The Osbourne Co., Louis Dow, Kemper Thomas, and American Art Works. John, as he was referred to by family and friends, signed his art "Hy Hintermeister". John, along with his son Henry, born in 1897, worked together and created over 1050 illustrations that were reproduced as prints and as jigsaw puzzles. Both artists used identical signatures, which made it hard to differentiate between the two artist's works. Many of the Hintermeister later works depict humorous scenarios, such as children caught up in unexpected comical situations. John Henry passed away in 1945, while his son Henry continued to paint. Henry lived until 1972.